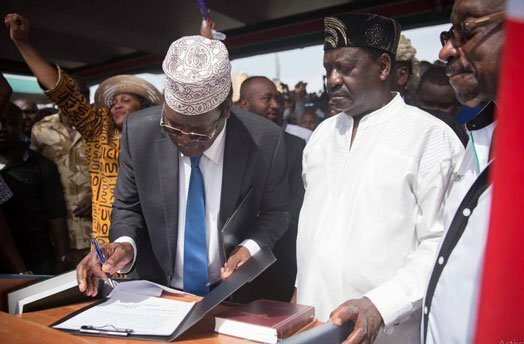 Controversial lawyer Miguna Miguna has been blocked by Raila Odinga on Twitter just a year after deputy president William Ruto also blocked him. “Mr. @WilliamsRuto has blocked me for criticizing him. He is not a private citizen,” Miguna tweeted after Ruto blocked him. He also ranted when Raila recently blocked him on Twitter, he claims Baba blocked him because of the details in his soon to be released book; Treason: The Case Against Tyrants and Renegades. “Mr. Hand-Chequer, @RailaOdinga, the chief cowardly hypocrite, blocks me on @Twitter as “TREASON: The Case Against Tyrants and Renegades” nears release. It’s going to be an EXPLOSIVE REVOLUTIONARY engagement ahead. Cheers! #SayNoToUjinga,” Miguna tweeted after Raila blocked him. Miguna Miguna lost his cool when section of Kenyans on social media poked fun at him after Raila blocked him. The controversial lawyer referred those who laughed at him as illiterates. “For illiterates on social media, I didn’t complain that Mr. Hand-Cheque @RailaOdinga blocked me: I CELEBRATED IT. It is proof that he read what I wrote and that TRUTH HURTS liars, hypocrites and cowardly dinosaurs like him. The revolution is coming! #SayNoToUjinga,” Miguna tweeted.